This question is about how I can match a pattern except some situations s1 s2 s3. I give a specific example to show my meaning but prefer a general answer I can 100% understand so I can reuse it in other situations. s1: Not on a line that ends with a period like this sentence. s2: Not anywhere inside parens. I know how to solve any one of s1 s2 s3 with a lookahead and lookbehind, especially in C# lookbehind or \K in PHP. But the mix of conditions together makes my head explode. Even more bad news is that I may need to add other conditions s4 s5 at another time. The good news is, I don't care if I process the files using most common languages like PHP, C#, Python or my neighbor's washing machine. :) I'm pretty much a beginner in Python & Java but interested to learn if it has a solution. So I came here to see if someone think of a flexible recipe. Hans, I'll take the bait and flesh out my earlier answer. You said you want "something more complete" so I hope you won't mind the long answer—just trying to please. Let's start with some background. First off, this is an excellent question. There are often questions about matching certain patterns except in certain contexts (for instance, within a code block or inside parentheses). These questions often give rise to fairly awkward solutions. So your question about multiple contexts is a special challenge. Sadly, the technique is not well known: I estimate that in twenty SO questions that could use it, only one has one answer that mentions it—which means maybe one in fifty or sixty answers. See my exchange with Kobi in the comments. The technique is described in some depth in this article which calls it (optimistically) the "best regex trick ever". Without going into as much detail, I'll try to give you a firm grasp of how the technique works. For more detail and code samples in various languages I encourage you to consult that resource. There is a variation using syntax specific to Perl and PHP that accomplishes the same. You'll see it on SO in the hands of regex masters such as CasimiretHippolyte and HamZa. I'll tell you more about this below, but my focus here is on the general solution that works with all regex flavors (as long as you can inspect capture groups in your code). Thanks for all the background, zx81... But what's the recipe? The method returns the match in Group 1 capture. It does not care at all about the overall match. In fact, the trick is to match the various contexts we don't want (chaining these contexts using the | OR / alternation) so as to "neutralize them". After matching all the unwanted contexts, the final part of the alternation matches what we do want and captures it to Group 1. This will match Not_this_context, but in a sense that match goes into a garbage bin, because we won't look at the overall matches: we only look at Group 1 captures. If you mentally try to split this regex at each | delimiter, it is actually only a series of four very simple expressions. For flavors that support free-spacing, this reads particularly well. This is exceptionally easy to read and maintain. The contexts you don't want are added to a list of alternations on the left: they will match, but these overall matches are never examined, so matching them is a way to put them in a "garbage bin". The content you do want, however, is captured to Group 1. You then have to check programmatically that Group 1 is set and not empty. This is a trivial programming task (and we'll later talk about how it's done), especially considering that it leaves you with a simple regex that you can understand at a glance and revise or extend as required. I'm not always a fan of visualizations, but this one does a good job of showing how simple the method is. Each "line" corresponds to a potential match, but only the bottom line is captured into Group 1. Here are some common problems that this technique can often easily solve. You'll notice that the word choice can make some of these problems sound different while in fact they are virtually identical. How can I match foo except anywhere in a tag like <a stuff...>...</a>? How can I match all words that are not on this black list? How can I ignore anything inside a SUB... END SUB block? How can I match everything except... s1 s2 s3? You didn't as for code, but, for completion... The code to inspect Group 1 will obviously depend on your language of choice. At any rate it shouldn't add more than a couple of lines to the code you would use to inspect matches. If in doubt, I recommend you look at the code samples section of the article mentioned earlier, which presents code for quite a few languages. Depending on the complexity of the question, and on the regex engine used, there are several alternatives. Here are the two that can apply to most situations, indluding multiple conditions. In my view, neither is nearly as attractive as the s1|s2|s3|(whatYouWant) recipe, if only because clarity always wins out. A good solution that sounds hacky but works well in many environments is to work in two steps. 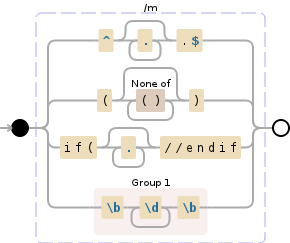 A first regex neutralizes the context you want to ignore by replacing potentially conflicting strings. If you only want to match, then you can replace with an empty string, then run your match in the second step. If you want to replace, you can first replace the strings to be ignored with something distinctive, for instance surrounding your digits with a fixed-width chain of @@@. After this replacement, you are free to replace what you really wanted, then you'll have to revert your distinctive @@@ strings. Your original post showed that you understand how to exclude a single condition using lookarounds. You said that C# is great for this, and you are right, but it is not the only option. The .NET regex flavors found in C#, VB.NET and Visual C++ for example, as well as the still-experimental regex module to replace re in Python, are the only two engines I know that support infinite-width lookbehind. With these tools, one condition in one lookbehind can take care of looking not only behind but also at the match and beyond the match, avoiding the need to coordinate with a lookahead. More conditions? More lookarounds. Recycling the regex you had for s3 in C#, the whole pattern would look like this. But by now you know I'm not recommending this, right? For the replacement string, you use $1. What happens here is that for each instance of s1|s2|s3 that is matched, the replacement $1 replaces that instance with itself (referenced by $1). On the other hand, when WhatYouWant is matched, it is replaced by an empty group and nothing else — and therefore deleted. See this demo, thank you @HamZa and @Jerry for suggesting this wonderful addition. This brings us to replacements, on which I'll touch briefly. When replacing with nothing, see the "Deletions" trick above. When replacing, if using Perl or PCRE, use the (*SKIP)(*F) variation mentioned above to match exactly what you want, and do a straight replacement. In other flavors, within the replacement function call, inspect the match using a callback or lambda, and replace if Group 1 is set. If you need help with this, the article already referenced will give you code in various languages. Ah, nah, I'll save that for my memoirs in twenty volumes, to be released next Spring. I let you know I set bounty on this question. In case you want to explain more as not 100% clear yet. If I may - the answer is long and detailed, which is great. The long buildup before the Key Fact title is a little too much - does it really add to the answer? The trick is pretty basic, like you said, and has been used in many occasions by many people (just a coupe of my answers for example: 1, 2, and many other cases like skipping quotes texts or escaped characters). Again, great answer. Thanks for the extensive list! You are right, it is probably easier to fall back on lookarounds, and this trick isn't used as often as it can be - which is a shame, because the pattern is much simpler. Thanks! +1, Very clever solution to take advantage of the short-circuit. This is kind of like DeMorgan's law in that "(I don't want this) and (I don't want that)" is the same as "I don't want (this or that)". Note that a similar bug manifestation appears in the popular Syntax Highlighter script. I wrote an article about that here: Fixing the SyntaxHighlighter 3.0.83 Parser Bug if anyone is interested. @ridgerunner To me, your example is saying that when input is unreliable, matching is unreliable (your example has an unbalanced quote)... but is that a surprise? It's like saying "Wait, this car doesn't behave like in the ad—when I dump a ton of nails on the road it doesn't steer properly." IMO the technique does exactly what it says it does. Edge cases are edge cases, and when we worry about them we try to think of ways to work around them. To my mind, the word bug is way out of place, as well as your phrase simply does not work (reliably). The bug is in the carrot, not the blender. @ridgerunner Completing this comment, is any regex ever sold with this promise: This will deal with any screwed up input? You know this, so to me your words sound needlessly harsh. @ridgerunner I always enjoy hearing from you, it just sounds unjustifiably harsh to me. When we know that our strings can contain "false alerts", we all adjust our patterns. For instance, to match a string that may contain escaped quotes that might throw a string matcher off, you might use (?<!\\)"(? :\\"|[^"\r\n])*+" You don't pull the big guns unless you have a reason. The principle of the solution is still valid. If we're not able to express a pattern to put on the left side, that's a different story, we need a different solution. But the solution does what it advertises. @Fede Thank you for your very kind words. :) I love this technique. At times when it looks like you might need an annoyingly intricate regex, it lets you write something that feels light, friendly, easy to understand and maintain. This answer has been added to the Stack Overflow Regular Expressions FAQ by user @funkwurm. Same as @zx81's (*SKIP)(*F) but with using a negative lookahead assertion. string = """cat 123 sat. 222 if(  //endif if(cat==789 stuff  //endif   333"""
for line in string.split('\n'):                                  # Split the input according to the `\n` character and then iterate over the parts. if not line.endswith('. '):                                   # Don't consider the part which ends with a dot. for i in re.split(r'\([^()]*\)|if\(. *?//endif', line):   # Again split the part by brackets or if condition which endswith `//endif` and then iterate over the inner parts. for j in re.findall(r'\b\d+\b', i):                  # Then find all the numbers which are present inside the inner parts and then loop through the fetched numbers. print(j)                                         # Prints the number one ny one. could you provide the reason for downvote? Conditions can change in future and anytime. One condition should not depend on others. The file given has minimal errors in it. If it doe then my code might need some modifications to cope with that. I used Stack to keep track of if( blocks. I used C# and with it MEF (Microsoft Extensibility Framework) to implement the configurable parsers. The idea is, use a single parser to parse and a list of configurable validator classes to validate the line and return true or false based on the validation. Then you can add or remove any validator anytime or add new ones if you like. So far I have already implemented for S1, S2 and S3 you mentioned, check classes at point 3. You have to add classes for s4, s5 if you need in future. Then comes the implementation of individual checkers, the class names are self explanatory, so I don't think they need more descriptions. it should not match 12345. The best part with it is that, for adding a new condition all you have to do is provide an implementation of IPatternMatcher, it will automatically get called and thus will validate. The washing machine works :) , what are you not understanding? Do three different matches and handle the combination of the three situations using in-program conditional logic. You don't need to handle everything in one giant regex. // Set up the matcher object. , @"\(. *" + mwe.SearchString + @". *\)"
, @"if\(. *" + mwe.SearchString + @". *//endif"
So above, we set up the search string (the five digits), multiple exception strings (your s1, s2 and s3), and then try to match against several test strings. The printed results should be as shown in the comments next to each test string. You mean maybe like match three regex in a row? Regex 1 eliminate situation 1 (maybe just delete bad digit), r2 remove s2, r3 remove s3 and matches digits left? That's interesting idea. @Yawar Upvoting your answer for suggesting an "out of the box" direction to investigate :). Your requirement that it's not inside parens in impossible to satify for all cases. Namely, if you can somehow find a ( to the left and ) to the right, it doesn't always mean you are inside parens. Eg. ((.....) + 55555 + (.....)) - inside parens even though there are closing ) and ( to left and to right. It is impossible to find out if you are inside parens using regex, as regex can't count how many parens have been opened and how many closed. Consider this easier task: using regex, find out if all (possibly nested) parens in a string are closed, that is for every ( you need to find ). You will find out that it's impossible to solve and if you can't solve that with regex then you can't figure out if a word is inside parens for all cases, since you can't figure out at a some position in string if all preceeding ( have a corresponding ). Nobody said anything about nested parenthesis, and your case #1 is handled just fine by zx81's answer. Of course it isn't impossible! This is exactly why you'd need to track of the level of parens in which you are currently parsing. Well if you're parsing some kind of CFG like OP seems to be doing, you are better served by generating a LALR or similar parser which doesn't have problems with this. [SOLVED] Non greedy (reluctant) regex matching in sed? [SOLVED] What regex will match every character except comma ',' or semi-colon ';'?